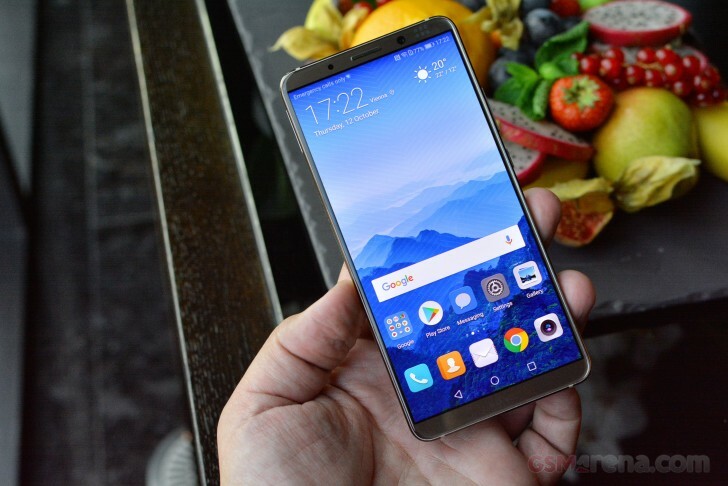 Huawei unwrapped its new Mate 10 flagships yesterday, which market the debut of the Kirin 970 chipset - a beast built around four Cortex-A73 and four Cortex-A53 processing cores, a Mali-G72 graphics processor and, in the case of the Huawei Mate 10 Pro, 6GB of RAM. We were there, front seat, to watch Huawei's global event unfold and managed to test out the Mate 10 Pro in a number of synthetic benchmarks so that you guys can see how it compares to the other flagships out there. Before we start with the scores, let's delve a bit deeper into the Hisilicon Kirin 970 inside the Huawei Mate 10 Pro. Its four high-performance Cortex-A73 cores that can go as high as 2.4GHz and four efficient Cortex-A53 cores that can run at up to 1.8GHz. This is similar to the Exynos 8895 Octa inside the Samsung Galaxy Note8, which uses four custom-made powerful cores clocked at 2.3GHz and four efficient Cortex-A53 ones clocked at 1.7GHz. The Qualcomm Snapdragon 835 found in the OnePlus 5, Nokia 8 and a number of other flagships (like the Galaxy Note8 in certain markets) uses custom Kryo cores in an octa-core configuration. Graphics on the Huawei Mate 10 Pro are handled by a Mali-G72 GPU with 12 cores, in contrast the Samsung-designed Exynos 8895 Octa has a slightly older Mali-G71 graphics processor but with 20 cores. The Snapdragon 835 has its own Adreno 540 GPU. So let's look at how the Huawei Mate 10 Pro did in our testing. Keep in mind that this is a pre-release unit so final results may differ a little. In the CPU-focused GeekBench 4.1 the Huawei Mate 10 Pro is more or less identical to its Android competition and only loses out to Apple's outstanding A11 Bionic chip inside the iPhone 8 Plus. AnTuTu 6 is a compound benchmark that focuses on 3D performance as well as memory and processor speed. Here the Huawei Mate 10 Pro was outdone only by the OnePlus 5 and the Apple iPhone 8 Plus. In Basemark OS 2.0 all flagships scored about the same - between 3,300 and 3,600 points. Moving on to graphics tests, the Huawei Mate 10 Pro soars to a quick lead, beating out all of its Android competition in the GFXBench 3.1 Manhattan 1080p test. In GFX's Car scene the Huawei Mate 10 Pro is a few frames behind its Android peers in the offscreen test and a few frames in front in the onscreen test - it leveraged on its lower screen resolution to beat the Galaxy Note8 by a huge margin. Finally, there's Basemark X where the Huawei Mate 10 Pro was last although not too far behind. In all of the scores above, the Huawei Mate 10 Pro was on par with its Android competition, only losing out significantly to the Apple iPhone 8 Plus. But then, comparing benchmark scores across platforms is rarely a good idea as developers are keen to point out. During our time with the Huawei Mate 10 Pro we enjoyed buttery performance, as can be expected from a flagship phone. Stay tuned for more tests of the Huawei Mate 10 Pro, coming soon. you clearly dont know much about computing. software and hardware intergration is key and apple have it to a tee.